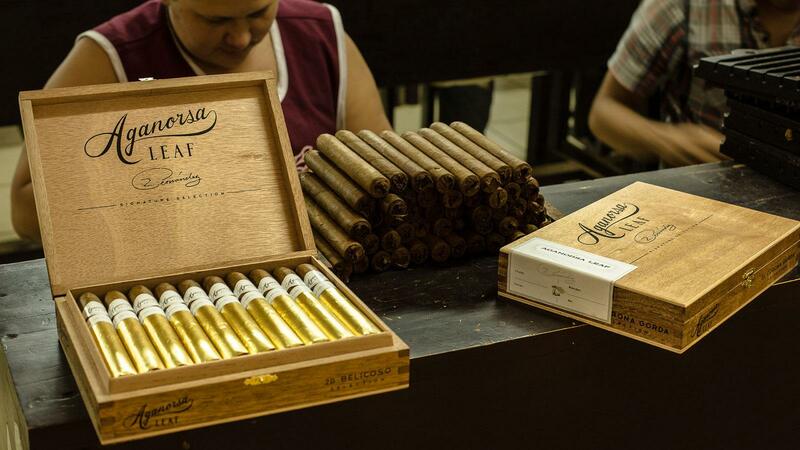 Aganorsa Leaf, the company behind Casa Fernandez and the collaborative Guardian of the Farm brand, has a new cigar coming to market called Aganorsa Leaf Signature Selection. The cigar debuted at this Summer’s IPCPR trade show in Las Vegas and it’s shipping to retail now. Blended by Max Fernandez, the son of Aganorsa founder Eduardo Fernández, Signature Selection wears a rosado-claro Corojo ’99 wrapper and Corojo ’99 binder. The filler consists of Criollo ’98, Corojo ’99 and a half leaf of rare medio tiempo tobacco. All of the tobaccos in Signature Selection were grown in Nicaragua by the Fernandez’s tobacco-growing conglomerate, Agricola Ganadera Norteña S.A.
Aganorsa Leaf Signature Selection, From top: Belicoso (6 1/4 by 52), Toro (6 by 52), Corona Gorda (6 by 44) and Robusto (5 by 52). The cigars were rolled at the Aganorsa-owned Tabacos Valle de Jalapa S.A. cigar factory in Estelí, commonly known as TABSA. Signature Selection comes in four sizes: Robusto, measuring 5 inches by 52 ring gauge; Belicoso, 6 1/4 by 52; Toro, 6 by 52; and Corona Gorda, 6 by 44. The cigars retail from $9 to $12, depending on the size. Only 500 boxes have been produced. Robusto, Belicoso and Toro ship in boxes of 20, while the Corona Gorda comes 25 to a box.